The Yankees have been trying to add a starter since the offseason and they finally landed one. 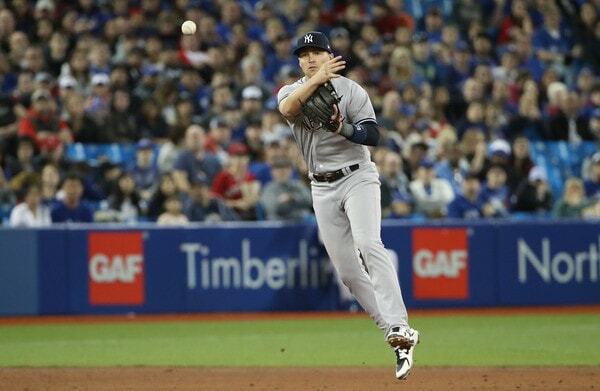 This afternoon the Yankees announced they have acquired veteran southpaw J.A Happ from the Blue Jays for infielder Brandon Drury and outfield prospect Billy McKinney. The trade has been announced and is official. Done deal. For all intents and purposes, Happ will step into the rotation to replace Jordan Montgomery, who was lost to Tommy John surgery earlier this season. Domingo German and Luis Cessa had been starting in Montgomery’s place the last few weeks, and while there were some promising moments, it largely did not go well. The Yankees needed another starter and they got a pretty good facsimile of Montgomery in Happ. Here is our Scouting The Market post on Happ. He currently owns a 4.18 ERA (3.84 FIP) with strikeout (27.4%) and ground ball (44.6%) rates that will play in Yankee Stadium. Happ has struggled recently — he’s allowed 26 runs in his last five starts and 31.1 innings — so the Yankees are clearly banking on his track record. He had a 3.33 ERA (3.87 FIP) with Toronto from 2016-17 and a 3.56 ERA (3.56 FIP) in 2018 as recently as June 24th. In Drury and McKinney, the Yankees traded two players with no obvious long-term fit. Drury came over from the Diamondbacks in February, the Yankees talked him up all Spring Training, he was the Opening Day third baseman, then he landed on the disabled list with migraines and blurry vision, and Miguel Andujar took over third base. Andujar’s emergence has made Drury expendable. During his limited big league time this season Drury hit .176/.263/.275 (50 wRC+) with one home run in 18 games while playing first, second, and third bases. He also hit .294/.403/.447 (144 wRC+) with five home runs in 55 games with Triple-A Scranton. The Yankees had Drury on their big league roster as a utility guy at various points the last few weeks, but he didn’t play much. Going forward, the Yankees had no place to play Drury barring an injury, and that means no way to rebuild his trade value. The disabled list stint and lack of MLB playing time hurt his value, no doubt. Clearly the Yankees like him. They wouldn’t have made the trade for him otherwise. But his three primary positions are third base (Andujar), second base (Gleyber Torres), and first base (Greg Bird), and the Yankees have young players there. As for McKinney, he was no higher than seventh on the outfield depth chart when everyone is healthy and no higher than fifth on the current outfield depth chart with Jacoby Ellsbury (oblique, hip, foot, back) and Clint Frazier (post-concussion migraines) on the disabled list. McKinney went from the A’s to the Cubs in the Jeff Samardzija trade, the Cubs to the Yankees in the Aroldis Chapman trade, and now to the Blue Jays in the Happ trade. McKinney, who made his big league debut with the Yankees in Toronto earlier this season, hit .230/.294/.502 (120 wRC+) with 13 home runs in 54 Triple-A after returning from a shoulder injury suffered when the crashed into the Rogers Centre wall in April. He’s one of those ‘tweener guys the Yankees didn’t have room for, much like Ben Gamel and Jake Cave, who were traded away recently. I had McKinney 22nd on my most recent top 30 prospects list. I’d mentioned in recent days the trade that sent Scott Kazmir from the Athletics to the Astros three years ago seemed like a decent benchmark for Happ, and it fits. Houston sent two mid-range prospects (Daniel Mengden and Jacob Nottingham) to the A’s for Kazmir. The Yankees sent two mid-range prospects (Taylor Widener and Nick Solak) to the D’Backs for Drury, then flipped Drury for Happ. Consider McKinney inflation. 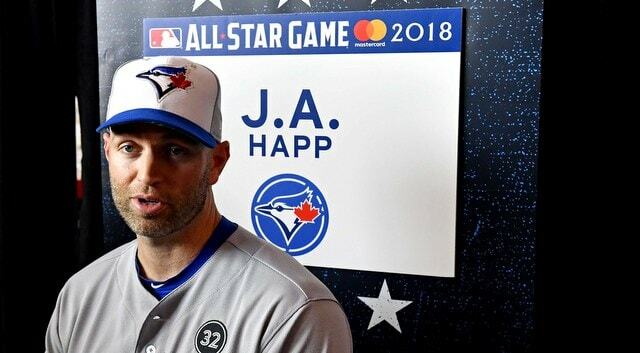 Happ is an impending free agent on a three-year contract worth $36M. His full luxury tax hit is $12M but his actual 2018 salary is $13M. He will count roughly $4M against the luxury tax payroll, less Drury’s and McKinney’s luxury tax hits. The net hit is something like $3.7M. The Yankees have plenty of luxury tax payroll wiggle room anyway. There’s still some payroll space remaining for another trade even if the Yankees don’t shed salary. With Happ and Zach Britton, the Yankees have upgraded both their rotation and bullpen — the bullpen didn’t really need upgrading, but hey, Zach Britton! — with five days to go before the non-waiver trade deadline. They might be done, though I suspect they’ll look for a catcher given Gary Sanchez’s injury and monitor the pitching market in case a high-end starter like Jacob deGrom becomes available.